July 12, 2012 By: Steven Rose, Jr.
Making a new version of “War of the Worlds” using footage from the original 1953 movie would be unimaginable to many. It would probably be a mismatch with today’s high tech special effects. But strangely enough, independent film makers Timothy Hines and Susan Goforth achieve realism by using both special effects, including CGI, and old film footage in their adaptation of H.G. Wells’ classic science fiction novel. 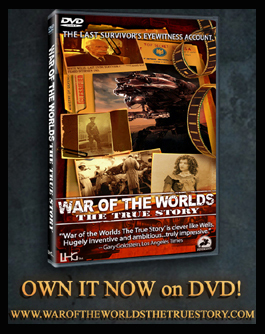 Hines and Goforth make the events of Wells’ terrifying tale of Martians attacking Earth a historical “reality” in their mashup documentary style movie, “War of the Worlds: The True Story”. Hines’s and Goforth’s version of “War of the Worlds” is told through the point of view of the last living survivor of the war with Mars, Bertie Wells (played by Floyd Reichman). He tells about his experiences of the 1900 Martian attack in a 1965 interview. Built around this interview is a mashup (or mix) of film footage both fictional and non-fictional that tells the story documentary style. Much of this footage serves as sets for the main cast whose images were digitally superimposed onto it. But this isn’t just a dull historical telling of the story. Think History Channel’s many dramatic documentaries of catastrophic events, such as wars and natural disasters, and you'll get a feel for Hines and Goforth’s movie. And so "The True Story" carries the suspense and drama of both the 1953 movie and Speilberg’s 2005 version but in a more realistic manner through its documentary style. What inspired a documentary style for the movie? Goforth said, at the Crest Theatre’s 3:30 Saturday afternoon screening, that it was Wells’ eye-witness/newspaper reporting style of his novel. When yours truly asked if the Orson Welles 1938 radio version’s mass panic had anything to do with that inspiration she said it absolutely did. People who had tuned in late to the radio play thought it was live coverage of an actual Martian invasion. The techniques used to make “The True Story” were very carefully done with a lot of thought and effort. Hines said at Saturday afternoon’s screening that he and Goforth very carefully chose the footage from the public domain and used it in a way so as not to cause infringement. Along with this, they had to be careful not to allow any of the Hollywood film clips to come across as usage for their own profit but only as usage for supporting the overall content of “The True Story”. Hines also said that puppetry was used to create the creature effects, such as the robotic war vehicles the Martians attack with. The puppetry was done realistically to the point of suspended disbelief. The robotic vehicles and other creatures are smoothly integrated into the setting. 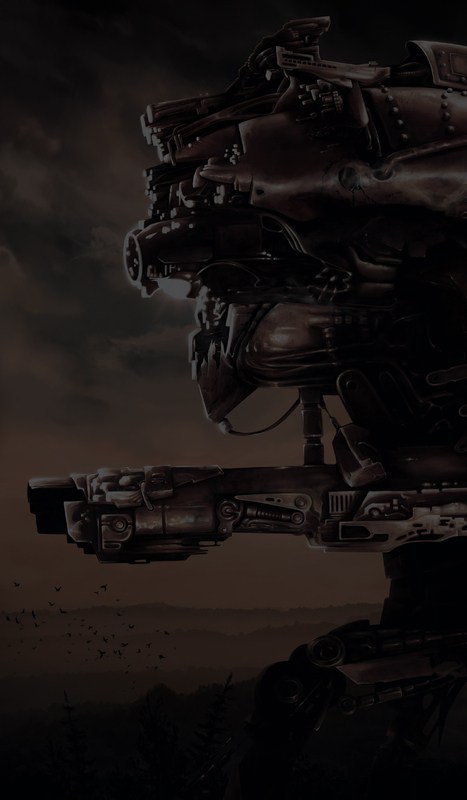 The audio and visual effects for actions such as the war vehicles' firing of heat rays and the collapsing of bridges and buildings give the audience a striking impression without leaving a sense of mismatch between old footage and modern special effects. Any flaws this movie had were outweighed by the high quality of the other elements such as script and technique. In an early part of the film, Bertie is shown in black-and-white footage walking with his wife, Amy (Goforth). In this footage, Bertie’s eye makeup, used to enhance shadow effect, on his right side shows when he turns his head toward the light momentarily. A few footages were mixed black-and-white and color. For example, the scene of the Martian ship crash is mostly black-and-white but the fire was colored orange. This was probably done for stylistic purposes but seemed to stand out a little too much for a scene that attempts to give the illusion of pre-color archival footage. Also, the 1965 interview scenes are clear and crisp in the first half of the movie but in the second half are made to look aged in the reel with scratching and molding effects. Q: I've heard that in WOTW: TTS, that your Martian is a animatronic rather than a CGI model. How big is it and does it work alot better than using a CGI model? A: The Martian was a full scale animatronic creature, the same as Yoda and Jabba the Hut in the original Star Wars saga. Whereas there are advantages and disadvantages to either a CGI or practical on set approach, the movie makers chose to build the creature in the real world and perform it live on set. When the Martian first appears and stares directly at the viewers, it feels organic because it is actually an FX artist controlling how and what the Martian sees. The visceral connection of organic conscious recognition in the creature is there live. The large otherworld monster was created by FX visionary, Ultrakarl. The artist himself was actually inside the creature animatronically operating its body movements and eyes. A second puppeteer was also inside the Martian operating the V-shaped mouth and thick drool which was pumped in through hoses. Breathing bladders were built into the Martian’s skin and were each billowed by a separate artist. The tympanic ear on top the Martian’s head was a bladder that was performed by a flautist through tubing. Blood was also pumped out of the eardrum in a controlled way to simulate the Earth’s greater pressure on the Martian physiology. The creature excreted sweat out of pours placed in specific areas though intricate tubing. Glycerin was continually reapplied to the surface of the creature’s skin to enhance the sweating labor of its breath under the Earth’s denser pressure. Fierce looking bug-like hairs were carefully punched into the Martian skin and rippled with the movements of the creature’s breathing. The tentacles were individually puppeteered with an FX artist working each tentacle. The Martian was large and looks real in the movie because it is real. Q: What scene took the longest to shoot and why? A: The first Martian cylinder pit on Horsell Common. Live production took place in a 70 meter dried out lake bed. The location cleanly resembled a meteorite crater. The live action elements involved many period-clad extras, principle cast and took 4 and ½ weeks to film in sweltering heat. The Martian pit was also recreated in 1/6th scale miniature and filmed separately. For that, the cylinder was operated from within by its creator, Ezra Hamill. All flames, fires, smokes and burning embers were live elements, some on set, some comped from over 300 separate plates in some shots. A forest of miniature trees scorched by the cylinder landing lined the crater and the path of destruction. A 2nd cylinder was created in 1/24 scale and shot live with guide wires later digitally removed in post. The Heat-Ray weapon extending out of the pit was a 1/6th scale miniature shot separately with multiple FX artists controlling its movements and deployment functions. Characters struck by the Heat-Ray were performed live full scale and then brought into the digital environment where a combination of CGI and practical elements of real flames and smoke were used to create the effects of incineration. Tentacles that grab the shop clerk struggling on the edge of the pit were created live in a FX shoot and layered in. The Martian creature, filmed on a green screen set, was a full scale animatronics puppet that took many FX artists to bring to life. Added to this are cutaways to printed “proofs” of photographic evidence and declassified documents. Also there was actual period footage, which was tracked and stabilized to remove original camera weave, jumps and film shrinkage. This was then composited with various effects, newly shot footage and other period footage elements. Scratches, dust, mold, funk, fading, rips and tears from the original film had to be extended through the various composited elements. When these shots were combined to satisfaction, the film gate weave and the jumps and bumps were added back in. There are many more scenes in the movie that are of a larger scope on screen, such as the Martian Fighting machine invasion of and exodus of London, and the Thunder Child, but behind the scenes for the sheer complexity, this first cylinder pit was the longest to shoot. Q: How did you make the Martian Fighting Machines Walk? 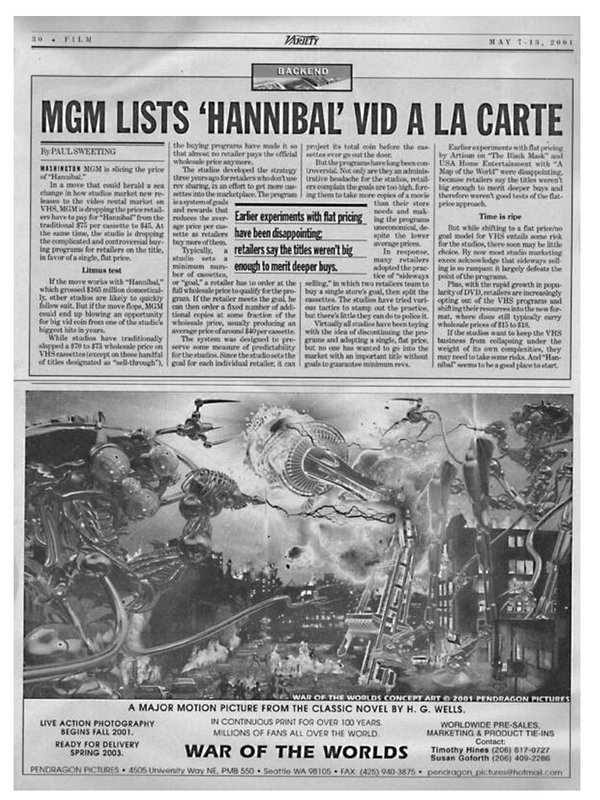 The 10-story-high Martian Fighting Machines were also realized through large scale mechanical miniature FX composited into live action footage. The walk cycle of the three legged monolithic war machines were based on the walks of existing heavy animals such as elephants. The Fighting Machines had to feel on screen as though they weigh hundreds of tons. There were many ways this was achieved. One of the key ways was creating a realistic manner in which the shoulder mechanisms compress and bare the weight as the giant machine steps down. There is compression and recoil to a single step. The more the weight, the more the compression and recoil. SEATTLE, WA -- Pendragon Pictures announced the US theatrical release of WAR OF THE WORLDS THE TRUE STORY in limited engagement showings in theaters beginning June 14 in Seattle at Landmark Theatres’ Harvard Exit, June 22 in Bellingham, Washington at The Mount Baker Theatre, and June 21-24 in Portland Oregon at the Cinema 21 and The Hollywood Theatre. Pendragon plans to release the sci-fi monster horror movie in California, Arizona and New Mexico beginning in July. Pendragon Pictures announces the US theatrical release of "War of the Worlds - The True Story" in limited engagement showings in theaters beginning June 14 in Seattle at Landmark Theatres’ Harvard Exit, June 22 in Bellingham, Washington at The Mount Baker Theatre, and June 21-24 in Portland Oregon at the Cinema 21 and The Hollywood Theatre. Pendragon plans to release the sci-fi monster horror movie in California, Arizona and New Mexico beginning in July. 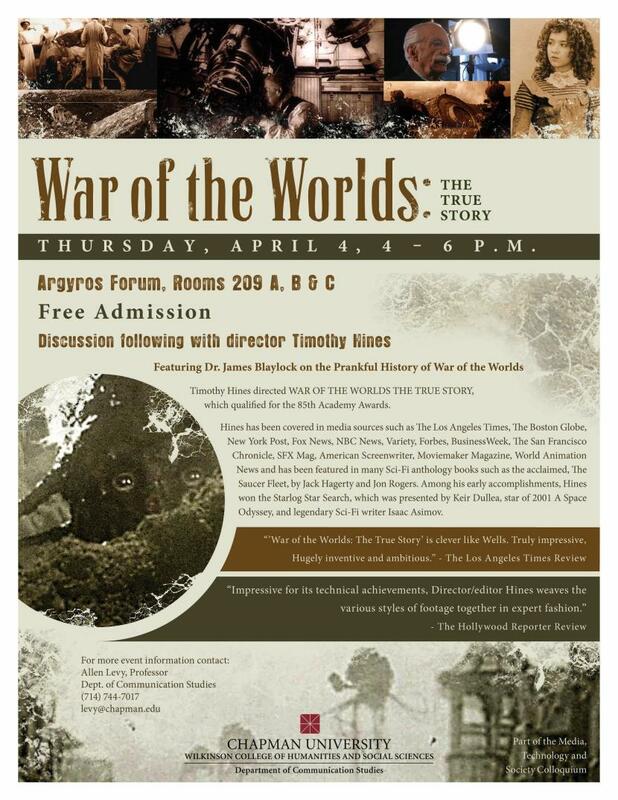 "War of the Worlds - The True Story" follows the eyewitness account of Bertie Wells, the last living survivor of the Earth/Mars War that took place in the year 1900, as he struggles to find his wife amidst the destruction of humankind at the hands of terrifying alien invaders. Like "Forrest Gump," "War of the Worlds - The True Story" uses cutting edge visual effects to blend a modern cast with battalions of actual fighting soldiers, golden age movie stars, and previously undisclosed images of tentacled alien creatures and their monstrous machines of war. Based on the most beloved sci-fi novel of all time by H.G. Wells, the movie is the result of a 15-year journey by Director Timothy Hines, Producers Susan Goforth, Donovan Le and a close knit group of artistic collaborators to bring the novel to the big screen. 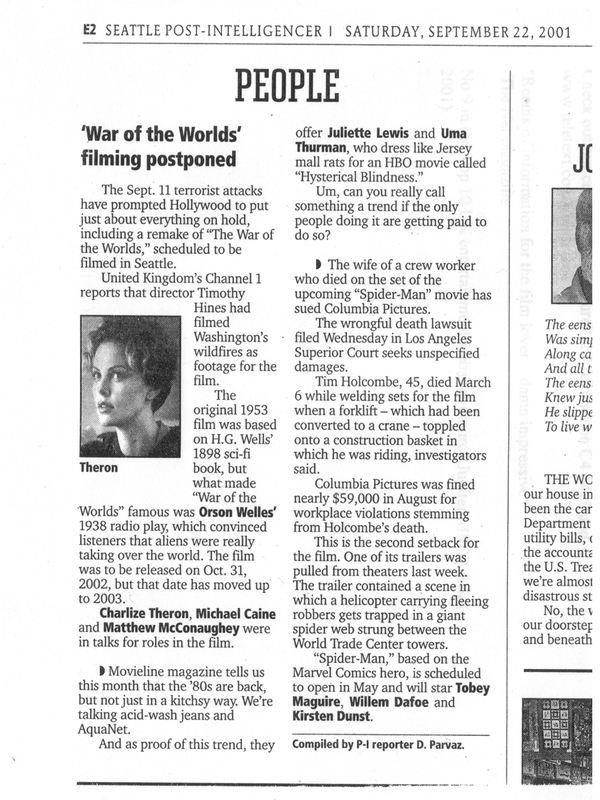 Starting as a $42-million production in 2001, Hines had submitted screenplays to and was in talks with the representatives of Charlize Theron and Michael Caine when the events of September 11th put the movie into turn around due to its themes about disaster. THE TRUTH IS REVEALED. There was a war between Earth and Mars. A film crew captured the memories of the last living survivor of the war between Earth and Mars that took place c1900. 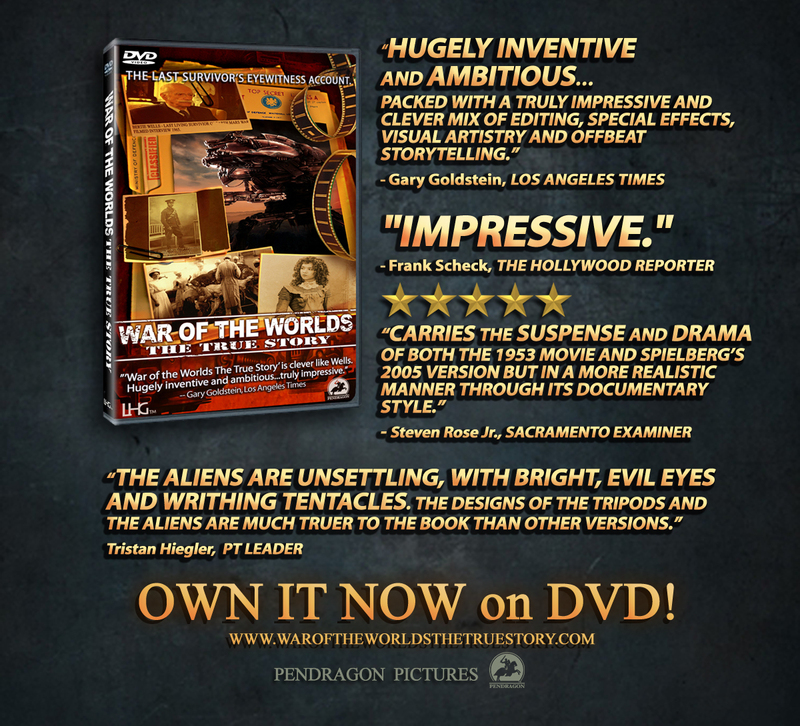 The filmed memoirs, discovered in a vault in 2006, were found with hours of previously unknown footage of the alien/Earth apocalypse, the actual Martian invaders and their war machines. This is the motion picture presentation of that eyewitness account. ”’War of the Worlds The True Story’ is clever like Wells. "I just returned from viewing this film at Cinema 21 in Portland. Forget Tim's 2005 fiasco. This was a complete vindication. The story is told from the POV of the last living survivor, Bertie Wells, in a 1965 interview. Once you accept that premise, settle in for a fast moving pastiche of stock footage images blended with re-creations, ala the History Channel, with images of the Martian machines woven, fairly believably, into the ancient film. The SFX are very well done; not standing out like a sore thumb especially as the Martian machines make their march burning everything in their path. The dialogue of "Bertie" are the exact words written by Wells in his novel and the actor brings a sense of authority and gravitas to his role. Yes, there are some niggling little things that history buffs and film nerds will be quick to latch onto (I saw Shirley Temple in one scene). But, that can be a source of fun when the Blue-Ray comes out. If you love the source material as much as I do, WotW:TTS is an excellent tribute to H.G. Wells novel and I recommend that it be seen when it gets to your town." - Jim Colvill, Portland Science Fiction Society. 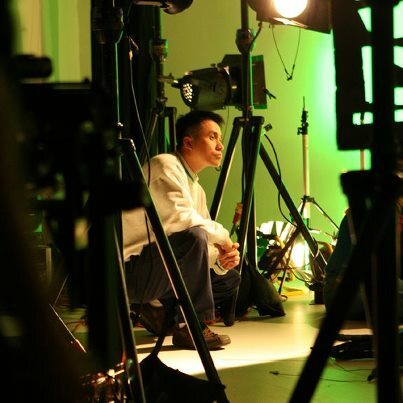 WAR OF THE WORLDS THE TRUE STORY Producer Donovan Le on the Martian effects set.